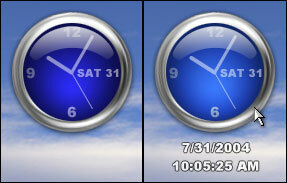 Some of my older DX clock objects used an antiquated analog clock plugin which prevented them from working correctly in the current version of DX. I figured that I should probably update them so that they'd still be useful and functional. Before doing that, though, I had to take the new analog clock plugin for a spin to learn about it and see how it differed. It turned out to be a piece of cake, so I decided to make the clock a bit more interactive to make it more interesting. By default the clock shows the time with the day and date displayed on the left. When you mouse over it, it lights up and displays the long date and time below the clock for quick reference. The graphics are basically those of the DX_Smokey clock, but tweaked a bit since they were kind of rough in their original incarnation. One of the best clocks I've ever seen. visually outstanding. Can the date format be customised to use dd/mm/yyyy? great work, nicely done, keep up the great work.